The computer controls the laser according to the information of each layer of the parts in the liquid photosensitive resin surface point by point scanning, the scanned area of the resin thin layer to produce photopolymerization curing, forming parts of a thin layer. After a layer of curing is completed, the table moves down a layer of distance, and then cured in the original finished resin surface and then apply a new layer of liquid resin, until the three-dimensional solid model. The method has the advantages of high speed of forming, high degree of automation, and can be formed into any complicated shape, and has high dimensional accuracy, and is mainly applied to the complicated and high-precision rapid prototype parts. 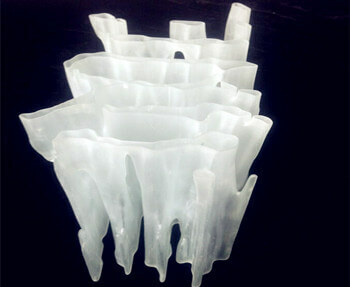 The advantage of 3D rapid prototype is mainly on its fast and complex structure shape. It is mainly formed through the accumulation of technology, so it has certain requirements to the wall thickness of prototype, such as: if the wall thickness is too thin, that will not be able to form. One of our clients needs a prototype with too much curves, and he was worried about the material strength. Because of it is big and heavy. We told him it’s OK to be formed by SLA rapid prototype technology. The material what we used is like Polycarbonate. Cost 4 Days to complete 1 piece, the finish is only lightly sandblasted.